Alex Jolliffe became junior men’s sprint champion on day four of the British Cycling Youth and Junior National Track Championships on Thursday. The Team Terminator rider defeated Speedflex Race Team’s Hamish Turnbull two-nil in the final at the Derby Arena. Turnbull settled for silver while Lewis Stewart of Glasgow Cycle Team won bronze with victory over Cameron Thompson. 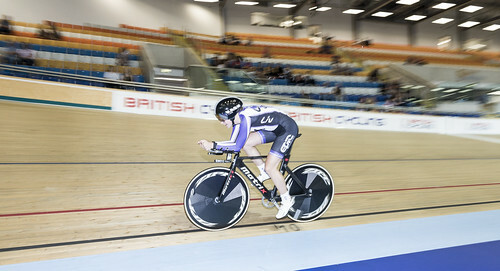 Eleanor Dickinson continued her impressive championships with by winning gold in the junior women’s pursuit over two kilometres. The Drops Cycling Development Team rider, who had two medals to her name already, set a time of 2.26.231 in qualifying before beating Liv CC-Epic Coaching’s in the final. Dickinson’s time was 2.26.276 to Raybould’s 2.30.532 as Raybould’s teammate Jessica Roberts won bronze against Hetty Niblett. Alistair Fielding of Black Line produced a fantastic 500m time trial for the British under-16 male title. Fielding stopped the clock in 33.886 seconds with Caleb Hill taking silver in 34.121 and Ethan Vernon bronze in 34.222. Thomas Bostock and William Draper took Madison under-16 male gold after winning the final sprint of the 40-lap race. The pair finished ahead William Tidball and Charley Calvert on 10 points. Jim Brown and Matthew Burke collected bronze. In the under-16 female 500m time trial, Ellie Russell came out on top in a time of 37.742 seconds, ahead of Ella Barnwell in 37.777 - the result a reversal of the outcome in the sprint. Esme Nesbitt was third in 38.099 seconds. The 20km Madison title was decided by a lap gain as Anna Docherty and Pfeiffer Georgi were crowned British champions. The duo had 12 points but the gained lap put them first ahead of Georgia Ashworth and Ellie Russell on 14 points. Gabriella Homer and April Tacey were third, a further lap down with 10 points. Lauren Booth took a superb double gold in the para-cycling 500m time trial and 200m flying lap. Booth’s factored time of 35.928 seconds put her on the podium ahead of Krispin Gardiner and Matthew Robertson in the time trial. In the flying lap, Booth’s factored time was 12.030 seconds, with Robertson second and Gardiner third. The championships conclude on Friday.